Mental and Sexual Exhaustion may be the result of a very high stress condition that hinders the human body with multiple symptoms that are often ignored as they develop gradually. Many people simply dismiss the exhaustion as “burn out”, naively hoping that a couple good nights of sleep or pleasant diversions such as a vacation or road trip would be just what’s needed to cure the exhaustion. It’s no secret that Russian scientists have spent many years studying the advantages of adaptogenic herbs and applying their potent effects to improve the endurance and concentration of their athletes and astronauts. The herbs also helped greatly in aiding physical recovery from long strenuous workouts or missions. 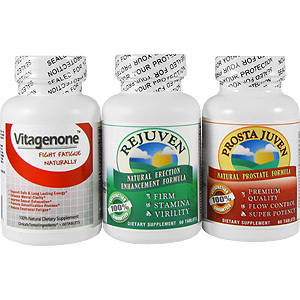 Many of the adaptogenic herbs, such as Rhodiola, Schisandra and Rehmannia that the Russians are taking are included in this powerful formula that is now available to anyone. Research has determined that many adaptogenic herbs actually suppress various stress hormones and cortisols while lowering overall stress at the same time. These herbs interact with the brain, central nervous system, adrenal gland, and other endocrine glands, reducing cortisol production while protecting stress-resistant proteins in the body. One of the key adaptogenic herbs in this formula is Rhodiola. The phytochemical salidroside from Rhodiola serves as an important component in its ability to help combat anxiety and stress-induced disorders such as concentration difficulty, irritability, tense muscles, and sleep disturbances. Recent animal studies have shown that Rhodiola can also reverse stress-induced anorexia. As a dietary supplement, take 2 tablets 2 times daily before breakfast and lunch. Use as a dietary supplement, take 4 tablets a day. Take Two (2) tablets in the morning and two (2) tablets in the evening. Or consult your healthcare practitioner on optimal usage. Use as a dietary supplement, take 4 tablets a day. Take two (2) tablets in the morning and two (2) tabets in the evening. Or consult your healthcare practitioner on optimal usage. This supplement is for male adult use only in the presence of any health condition, or if taking prescription medicine or other dietary supplements, consult with a healthcare practitioner prior to use. Keep out of reach of c hildren. Keep bottle tightly close, Store in a dry and cool place. Panax Ginseng, American Ginseng, Korean Ginseng, Guarana seed, Astragalus Membranaceus, Atractylodes Macrocephala, Dogwood, Dong Quai, Cimicifuga, Citraus Peel, Licorice, Bupleurum Chinense, Fo-Ti, Tumeric Root, Passion Flower, Milk Thristle, Maca, Rehmannia Glutinosa, , Paeonia Suffruticosa, Poria Cocos, Dioscorea Opposita, Alima Plantago, Lycium Barbarum, Chrysanthemum, Oriental Arbovitae, Opiopogon, Poria Cocos Wolf, Scrophularia. Rhodiola Rosea (Solidrosides 1%),Rhodiola Rosea (Rosavins 3%) L-Arginine, L-Glutamine, L-Lysine, L-Ornithine, L-Tyrosine, L-Taurine, L-Alanine, L-Methionine, N-Acetylcysteine, Acetyl-l-carnitine Hydrochloride, Soy Isoflavones. Warning: This supplement is for adult use only. This supplement contains caffeine and might not be suitable for people who are sensitive to caffeine, pregnant or nursing. In the presence of any health condition, or if taking prescription medicine or other dietary supplements, consult with a healthcare practitioner prior to use. Keep out of reach of children. Keep bottle tightly close. Store in a dry and cool place. Works great. Really recommend it to anyone who wants to be able to stop. My sperm count started goig up with this stuff. I was also able to last a lot longer and it is great becase you are able to heal everything at the same time. My brain was on fire from addiction. What ever is in these pills is like a soothing ice pack for my brain. 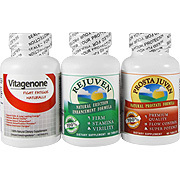 I just take Rejuven and Prosta Juven. Vitagenone is way too powerful for me. Truly amazing. Life changing. if you think you did masterbation too much then please dont buy because it doesnt work,for me initially it gave little relief but wonot works at all donot waste your valuable time serching for what products works for you instead go to a well qualified doctor. Anonymous "i can feel it"
definitely does something, this is after 3 days! I'm 17 and have been whacking it for bout 4 years. I suffer from seual ehaustian but am I still too young to take this in regard to testosterone levels.